Dental hygienist Shelley Mitchell has traveled to 32 nursing homes so far in Oklahoma, teaching health care workers why oral care is so important, including its link to preventing pneumonia, a leading killer of nursing home residents. Nurses and aides sit on couches and armchairs usually reserved for movie night. The workers recoil as pictures of severe plaque, tooth decay and bleeding sores are projected on the wall of the nursing center in Meeker. Dental hygienist Shelley Mitchell says this is what happens when nursing home residents don’t get their teeth brushed. “A lot of the residents I saw this morning, I saw a lot of plaque, I saw a lot of plaque, and I saw a lot of missing teeth,” she said. Mitchell is part of an effort to fix that. She works for TMF Health Quality Institute, a company contracted by the state. The new program is funded with nursing home fines collected by the state health department. It was created in 2017 and may be renewed next spring. She’s traveled to 32 nursing homes so far across the state to teaching health care workers why oral care is so important, including its link to preventing pneumonia, a leading killer of nursing home residents. “The first visit I do the screenings on 10 residents at each home, and then I do three separate trainings at each [nursing] home,” Mitchell said. Just as nursing home workers are expected to help residents bathe, they are also supposed to brush the teeth of people who can’t do it themselves. Just as nursing home workers are expected to help residents bathe, they are also supposed to brush the teeth of people who can’t do it themselves. It’s so important that it was federally mandated in a historic national nursing home reform bill passed in 1987. Thirty-one years later, Mitchell says most resident’s teeth that she sees still aren’t being brushed. Who pays for dental care? Older Americans often lose employer-based dental coverage when they retire — an age when many start suffering greater dental problems. Data from the Centers for Disease Control and Prevention suggest 70 percent of senior citizens have some form of periodontal disease. Yet basic Medicare plans do not include dental coverage. It’s an optional benefit under Medicaid, and each state determines the extent of coverage. Some states cover all 13 dental services recommended for adults — Oklahoma only covers four emergency dental services, like teeth extraction. Oklahoma could choose to expand its Medicaid dental coverage to include more services for adults, just like it does for children. About three out of every four nursing home patients use Medicaid. “But then there’s also challenges with looking for a provider that’s willing to accept the amount that Medicaid might pay for that emergency dental care, so I think there are significant challenges,” said Lori Smetanka, executive director at The National Consumer Voice for Quality Long-Term Care, an Washington, D.C.-based advocacy group. 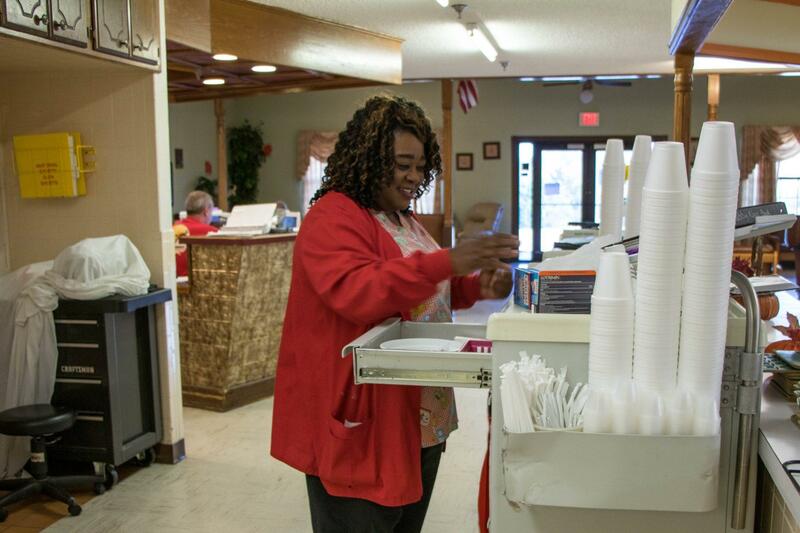 Oklahoma nursing home residents are not entitled to an annual routine dental cleaning. If the resident requests a cleaning or if the nursing home does a health assessment and determines the resident needs a dental service, then the nursing home has to arrange for it. Smetanka said nursing homes are required by law to help residents apply for reimbursement for unaffordable dental bills, but it doesn’t often happen. Vivian Roberts has been a certified nursing assistant since 1993 but has only worked at the Meeker nursing home for a few days. She didn’t know that plaque is made up of bacteria until Mitchell’s presentation and says she wasn’t taught about oral health in her CNA program. “We get in such a hurry sometimes, that we worry about how they look and that they get fed and clean,” she said. “We really don’t take that time to say, ‘can I see your mouth’ you know, ‘can I see if you rinsed today,’ to check that out. Vivian Roberts has been a certified nursing assistant since 1993. She says she wasn’t taught about oral health care in her program. The program teaches nursing home staff strategies on dealing with dementia or Alzheimer’s patients who clench their mouths — or even try to hit aides. Roberts said that will help. Who looks in Grandma’s mouth? National statistics on nursing home oral health are spotty, so it’s hard to know how Oklahoma compares to other states. The state department of health licenses nursing homes and does surprise inspections, as well as responding to complaints submitted by the public. To date, the state health department has cited three nursing homes for dental violations in 2018. “This one has to do with dentures; we found that two that had broken dentures,” said Debra Zamarripa, the survey manager in the state health agency’s Protective Health Services, Long Term Care division, reading notes from one of the inspections. After a nursing home is cited and possibly fined, staff must submit a plan to fix the problem. State health authorities then check up to see if the fixes were made. The agency often finds that a physician has issued medical orders for a resident to get certain dental services, but it hasn’t been arranged by the nursing home. 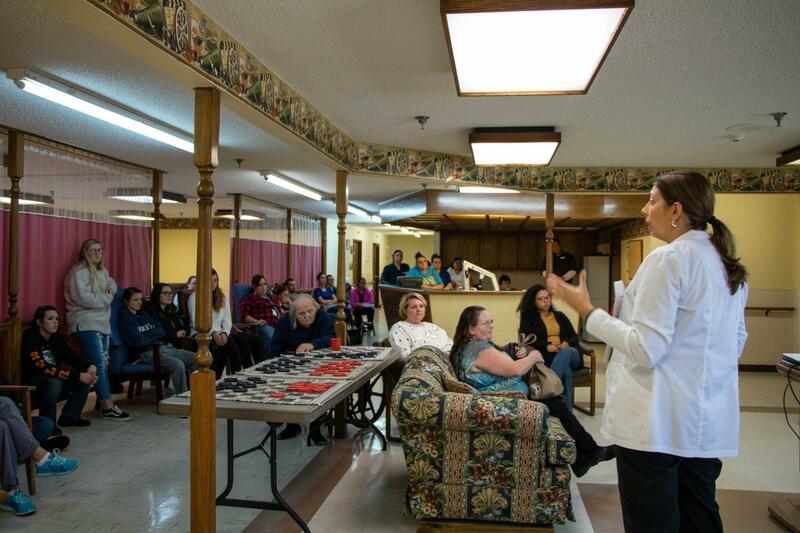 Shelley Mitchell, the dental hygienist, wraps up her presentation at the Meeker nursing home. Across the game room, a lone man in a wheelchair plays both sides of an oversized checkers game. He looks up when she asks the staff a question. The nursing home workers shake their heads: No, they don’t. If the high-pitched whir of a dentist's drill as it bores into your molar terrifies you, good news! There could be fewer fillings in your future. 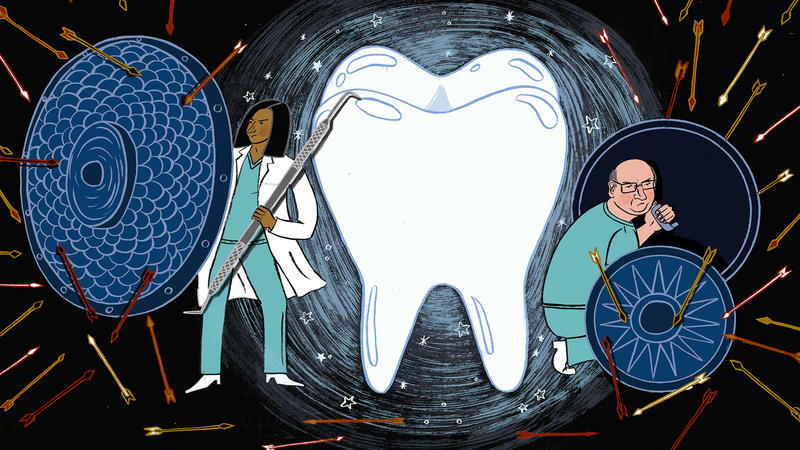 A painless way to prevent cavities in adults is gaining traction. After her divorce, Lori Taylor wanted a home all her own. She moved back to Oklahoma to be near her aging parents, but she had a problem. For years her personal caregiver had been her now ex-husband. “I have cerebral palsy and that’s brain damage that I incurred at birth, and it affects my motor skills. I’m confined to an electric wheelchair. I can stand but I can’t walk, I have very limited use of my arms,” Taylor says, sitting in the living room of her Norman apartment.